Four player teams. $100 a team. Breakfast, lunch, and guaranteed two games! All proceeds benefit the Wounded Warriors. Learn more about the Wounded Warriors here! 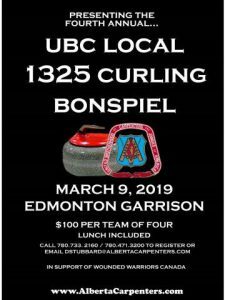 Saturday, March 9th, Edmonton Garrison Memorial Golf & Curling Club. Call 780.733.2160 or 780.471.3200, or email dstubbard@albertacarpenters.com to register! Want to sponsor door prizes? You can do that too! Good prizes, great times, for a good cause.